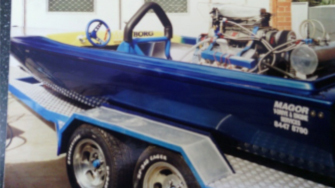 Pro Formance Racing began in 1995 with our Stephens 15.5 foot tunnel runner ski boat in the 5.2 litre class powered by a 308 Holden. 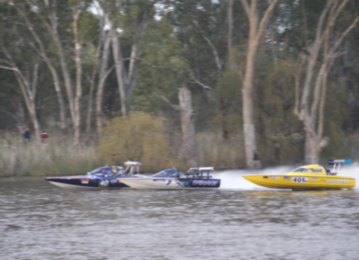 Within our first year we won many trophies including the Australian Power Boat Association (APBA) and Adelaide Speed Boat Club (ASBC) rookie of the year. 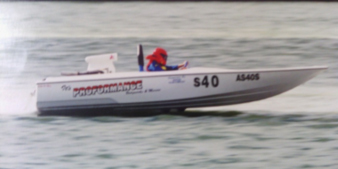 In 1997 still racing our 308 powered Stephens we upgraded to higher race classes. 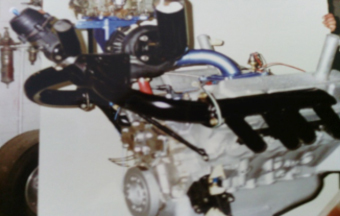 At one stage we even upgraded to the unlimited class were we gained a third place in the Living Health State Championship against supercharged big block Chevs. While racing in the unlimited class we felt the need to go forced inducted so we tried NOS (nitrous oxide) to gain more power at less cost and it worked very successfully! In the meantime the team built a single turbo [TO4] 308 Holden however, this was very hairy to drive in a 15.5 foot boat. 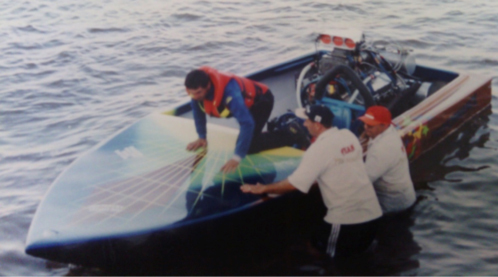 In late 1998 the team designed and built a new 18 foot race boat, a Pro Borg design so we could use the power our engines were making. 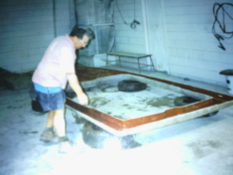 The development of plugs and moulds was first on the list followed by the first boat. Building started with an engineered layup of carbon fibre and balsa. 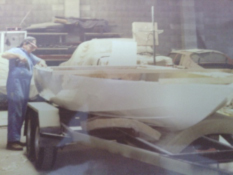 The first boat was out of the mould and assembled using the 308 Holden engine. 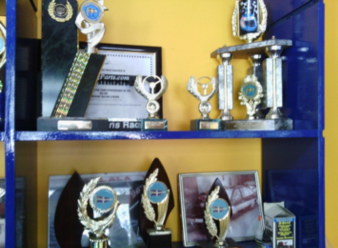 We raced successfully winning many races and trophies. The hull performed great and cornered like it was on rails, very tight and at great speed. 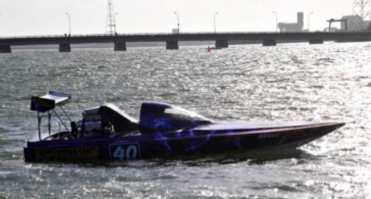 Dean and the team then decided it was time to purchase a 540 cubic inch blown injected [14/71] Big Block Chev engine and fitted it to the light weight boat. 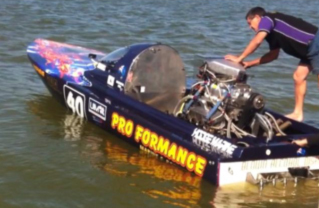 The boat was too light and very hard to handle with the horsepower of the engine. The light weight boat was retired. 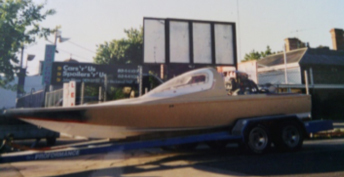 The second boat out of the mould was built as a heavy weight hull to be able to withstand the horsepower of the Blown Big Block engine. 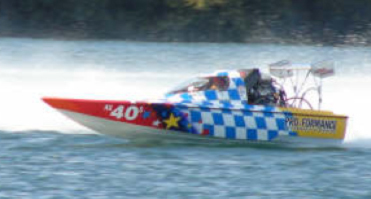 Completing the second hull we assembled and fitted the 540 cubic inch blown motor, this was raced with more success for two seasons. 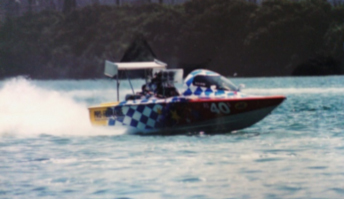 Within this time we worked on bringing back the carbon fibre boat with the 308 Holden engine which was driven by Dean’s late Brother David Borg. The boat went through a complete rebuild with new paintwork and refitted out with new bolts, nuts and cables etc. 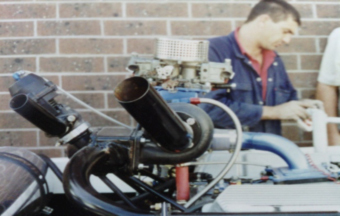 Through the season of racing David built a methanal injected small block Chev to gain more horsepower than what the old 308 Holden engine could produce. 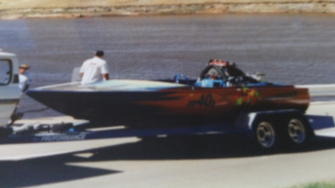 Our race team consisted of two boats to maintain. The engine builder Vince Borg, my father, was kept very busy checking engines after each race meeting. 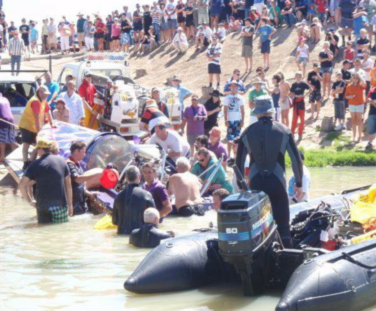 Throughout the season of very competitive racing the 5.2 litre carbon fibre boat came to a sudden stop! The side was torn out when the boat breached in a corner and sank. At this stage the team regrouped and started to build a replacement boat for the 5.2 litre class. This time Dean redesigned and built a 17 foot long V bottom hull. The V bottomed boat performed very good in a straight line and cornered as tight as the previous hull. The team was back to having two boats on the water. In 2001 we developed and build a reinforced drivers cockpit based on an American style cockpit with modifications to suit our hull. The cockpit was manufactured using mainly carbon fibre composite. The first windscreens were purchased from America out of a F15 fighter plane and cut to suit the cockpit opening. The cockpit was fibre glassed to the hull and deck so it would be an integral part of the boat an stay intack in any form of accident. 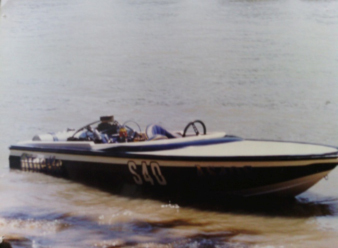 Once the supercharged unlimited boat cockpit was fitted and tested the 5.2 litre class boat was also fitted with a cockpit, drivers safety was paramount, both boats where also fitted with steel tube roll cages and onboard oxygen for the drivers safety. 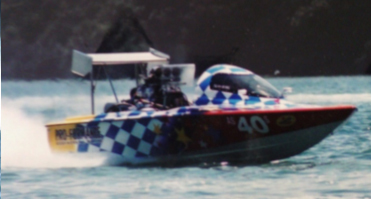 For many years Dean raced both boats throughout South Austrailia wining many trophies. 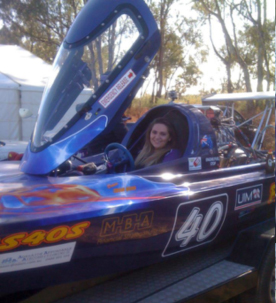 As soon as Dean’s daughter, Ellise Borg, turned sixteen in 2007 she obtained her boat licence so she could take over driving the 5.2 litre boat [the yellow one]. 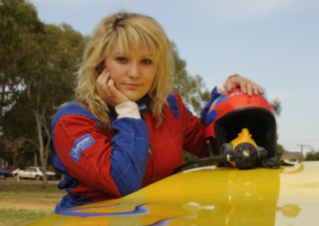 She did a great job at keeping the men honest and won the Rookie of the year at ASBC and came second place in the clubs season points series. 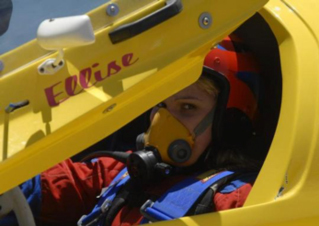 Ellise raced for three years being very competitive in the class. In the middle of the boat and cockpit building Team Pro Formance built a Junior boat for Dean’s son, Nicholas Borg. 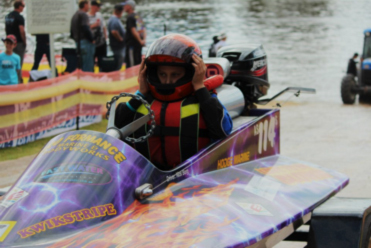 At the age of eight Nicholas started racing and being very competitive in his class. 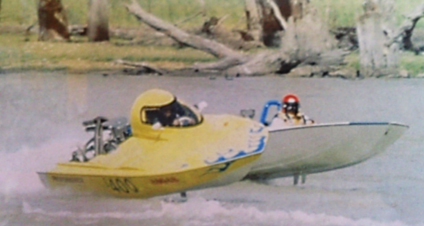 The boat ran a six horsepower Mercury outboard. Once he turned ten he then ran a ten horsepower motor. 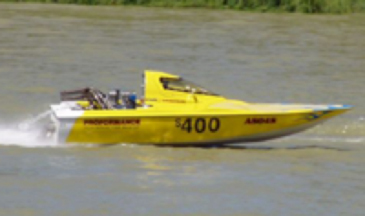 Through the seasons of racing the supercharged unlimited boat it was involved in a several accidents. 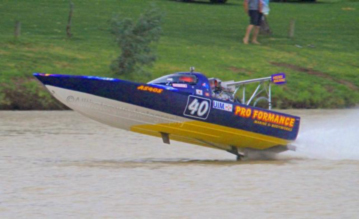 One was casued through loosing a blade from the propellor throwing the boat approximatly twenty foot high through the air only to land the right way up luckly this was at Adelaide Speed Boat Club, close to home! The damage caused from this was a hole in the hull and the complete drive line wrecked. Another accident occurred early in the 2008 season where another boat tee boned the side of our boat. The boat sustained heavy impact to the cockpit area and tore the port side of the hull open. 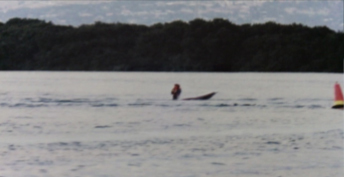 The boat was then retiered from racing however, the hull was repaired and a new deck was fitted and sold as a ski boat. 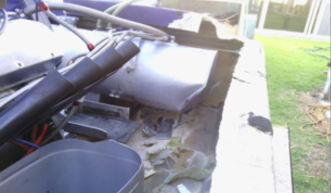 The new owner was informed of all the accident damaged as well as the new repairs. 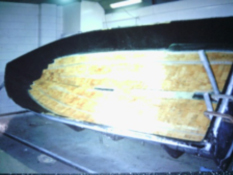 Later in 2008 the team designed a new twenty foot Vbottom boat a Pro Formance ECN design, to hopefully withstand the horsepower as it was getting to much for the eighteen foot hull. The work started and the new boat was out the mould and ready to race in no time. During testing we had major engine and gearbox failure which put a hold on our racing. 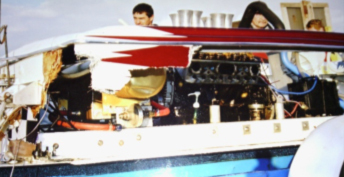 Once the boat was on track and showing great potentual we were hit by another big accident wrecking the brand new boat. 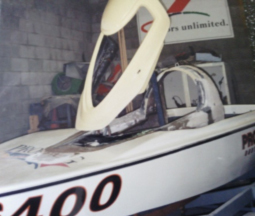 In January 2010 Dean was racing at Berri, South Australia and the boat lost a propellor blade at around the 130mph barral rolling the boat through the air landing upside down lucky for the drivers cockpit Dean excaped without any injury. After the terrifying accident at Berri it was back to the building stage once again with only nine months to build and fit out a complete new boat. 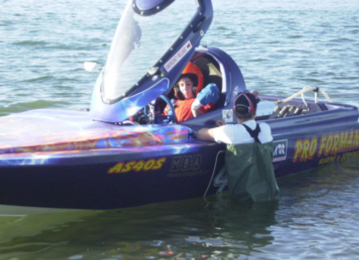 This was because the UIM World Championships were to be held in October 2010. 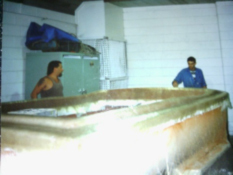 In the mitts of running the Crash Repairs side of things every bit of spare time went into manufacturing the new boat from ground up. Months went by very quickly and not knowing September had hit and the boat was unpainted with only half the running gear fitted. At this stage it looked pretty grim to making the October UIM World Championships. The team put many late nights and every bit of spare time we had to try and make the deadline. Two weeks before the race meeting the fitout was finish and the engine was running, now was the time for painting and finishing off. Thursday night before we had to leave a finial check over was completed and it was time to start packing all the spares and loading the trailers. 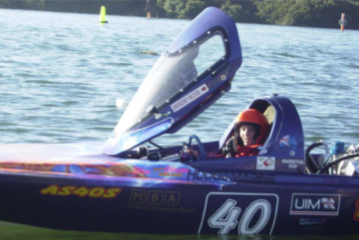 The nerves had kicked in but the road trip started at 2.00am Friday and off to the UIM World Championships we went with an brand new untested boat. Arriving in Gol Gol, New South Wales at around 7.00am we were planning to test the boat before the Championship on Saturday but with rain pelting down the Friday practice was cancelled. Saturday morning came with fine weather so the team were up early to set up for the boats first ever run, the boat ran very well straight off the trailer but some minor adjustments had to be made. Before we knew it, it was time for the first race bringing home a place which boosted the team, with more adjustments and tuning through out Saturday’s racing. Saturday’s point were tallied giving the the third highest points. On Sunday morning there were two more qualifying rounds and then the afternoon finals were held. 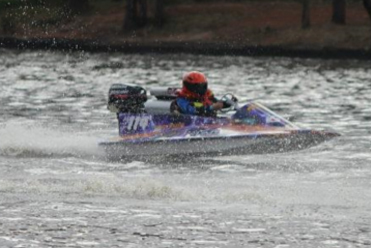 The new boat qualified in pole three and finished third outright for the weekend. 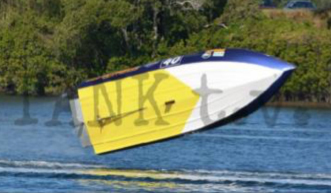 The team was estatic with the outcome that we were third fastest unlimited boat in the World. 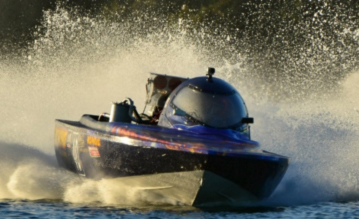 This was one of our biggest efforts from running a brand new untested boat to coming home in third place but most of all running all weekend without any problems. 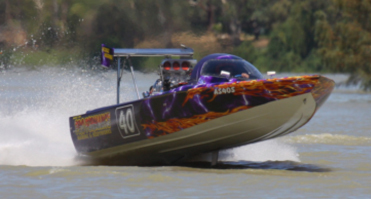 Another season had past and with the boat still handling great and the engine still strong the team decided it was time travel interstate. 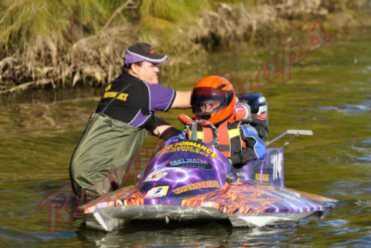 In Feburary 2011 the team drove over to Melton, Victoria for the annual Melton Gold Cup and Australian Unlimited Championship finishing second in both. 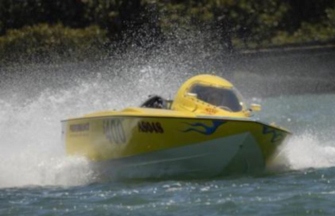 In 2012 the UIM World Championships were held again but over two whole weekends. 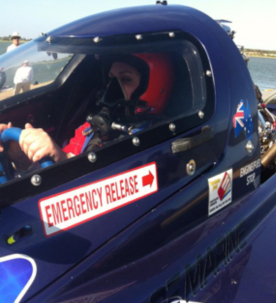 The first trip saw the team headed to Mildura, Victoria completing the weekend in forth overall positining. 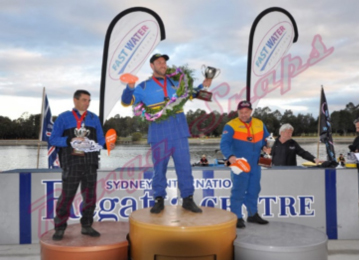 The second weekend was held in Penrith, New South Wales were Dean drove completivtily and finished in third place, making him third in the World once again. 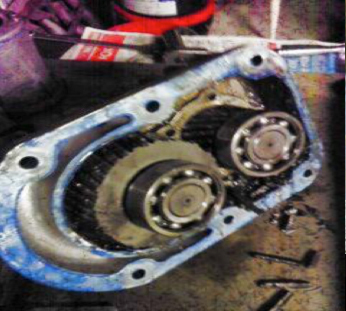 Late 2013 the engine was changed to a 454 Big Block Chev and the gearbox was change to suit. 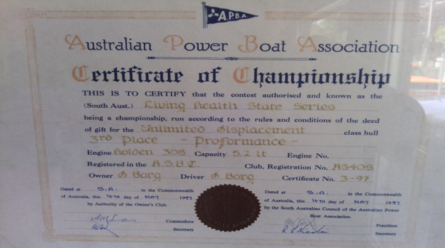 This was because as soon as Dean’s daughter, Christie Borg turned sixteen and obtained her boat licence so she could have a go at boat racing. 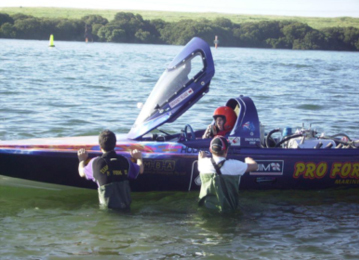 She completed one full race meeting in the boat and enjoyed it. the sport as much as possible. 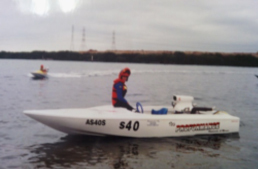 In 2014 with Dean driving at Tarree, New South Wales in the UIM World Championship meeting the boat was involved in accident breaking the port side of the deck and hull. 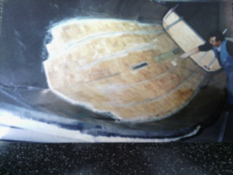 Fiberglass repairs were carried out at the track to keep the boat competing for the whole weeked. 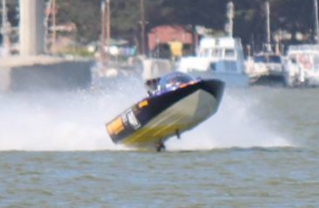 With only missing a few races from repairing the hull we were behind in points but finishing fifth for the weekend. 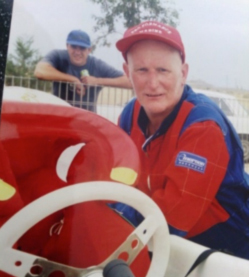 Towards the end of 2014 Dean was testing a new motor and computer system in Blown Big Block boat which didn’t turn out the best as the boat flipped and was total wreck. 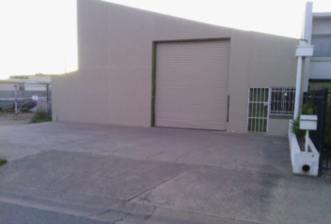 There will be a new boat built at a later stage but with business growing and the need of more room the purchase of new bigger premises has taken place. 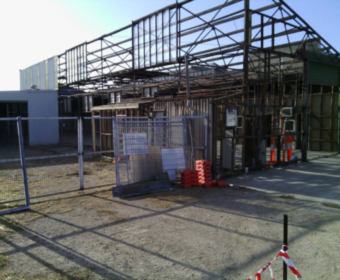 The new building was brought in November 2014 and the renevations are well on the way to be ready to move into in late June 2015.